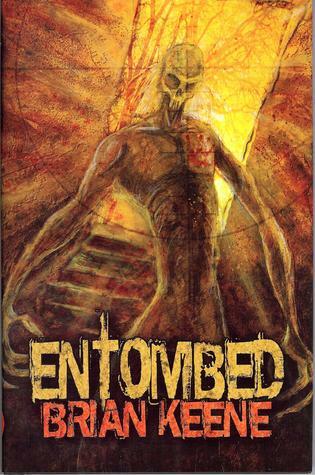 Entombed is a novella by horror mastermind Brian Keene. It is set in the same world as Dead Sea and the short story, “Couch Potato.” The plague, known as Hamelin’s Revenge, is decimating the world as human and animal alike are turned into the walking dead. Unlike the zombies of The Rising, which are imbued with the spirits of demons, these undead are the slow witted and slow walking corpses of George Romero’s movies. This not to say that they cannot be deadly. However, Entombed is not about zombies. Rather it is about the evils men inflict on one another. Twenty-five uninfected humans have retreated into a large bunker below ground to flee zombie menace. This bunker had been initially built to house the president and his staff in the event of a nuclear war. However, it had been converted to a museum prior to Hamelin’s Revenge. Now, the survivors have been there for over a month. The building continues to function, but their limited food stores are gone. Outside the zombies mindless pound away at the blast doors seeking entry. The menace cannot enter, but neither can the survivors leave. They are trapped and hungry. Faced with starvation, they vote to resort to cannibalism and have chosen to eat our narrator, a man by the name of Pete. From Pete’s perspective, this whole notion of cannibalism is crazy. He didn’t vote for it. His roommates are mindless savages. If they want to eat him, let them try. He is willing to fight to protect himself. Yet, despite all Pete’s rage he is still just as a rat in a cage. He is frantically trying to hold on to the last few threads of his own sanity, but it seems everything wants to eat him. As the body count rises, Pete finds himself abattoir of life and death in this new hell on earth. Entombed is among the most violent stories ever written by Keene. Pete kills, and kills, and kills. While he tells himself that he does these acts to survive, there is no future for any of them. It is this truth which finally sends Pete’s mind reeling past the point of no return. Logic be damned. He is no different than the instinct-driven zombie who hungers at the blast door. The novella is delivered brilliantly and lasts just long enough to get the point across. Pete is concerned with “me, myself, and I.” In many ways, his life was over long before he stepped into that bunker. He never stops to think about the bigger picture, right up until the end when there is no picture left to think about. For those looking for stories where a group of survivors band together to deal with the innumerable zombie hoards, Entombed is not for you. Instead, it is a bleak and uncompromising look at the greedy and selfish nature of the human soul and is heavily seasoned with acts of ultra-violence. If that appeals to you, pick up Entombed today, right here.